Our making service can offer curtains and accessories made especially for you. Ranging from a 7 day service, right up to bespoke, whatever the budget, we can sort out the best solution for you. We all know finding the right fabric can be a nightmare, which is why we offer our free sample service. So if any of our fabrics catch your eye we are more than happy to request a free sample of your behalf. Please allow up to 5 days for this service. Alternatively, our books and hangers are all available to take home (deposit required). The Fabric Shops offer an Express Made to Order Service, usually available within 7 working days from order, or a detailed made to measure, bespoke custom made blinds service. Contact us for more info. 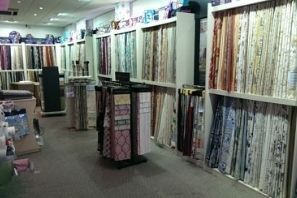 A wide choice of excellent quality fabrics from transparent through to solid colours, designs and blackout fabrics. Venetian blinds made from a choice of metals of any colour through to woods giving many different looks. Silhouette blinds are an excellent product that combines the best features of voiles and Venetian blinds in one product.